Such emails from the UK patients land in our mailboxes on daily basis. And while Cancer Research UK website shows 0 results if you enter “Rigvir”, we decided to crystallize your choices. All in one article. Rigvir® was registered in 2004 in Latvia as an anti-cancer virus with almost no side effects. In 2016, the drug received Horizon 2020 grant (the European Commission funding programme) to be approved by European Medicines Agency and brought from the clinic to the market. For that reason, approval by MHRA (Medicines and Healthcare products Regulatory Agency) is currently staying out of focus. Consequently, to date you cannot find Rigvir® in pharmacies or NHS hospitals. Step 1. Whether you inquire about yourself or the one you love, look through the list of cancer types below. Technically, Rigvir® has been registered to treat only melanoma. However, for other cancer cases the drug was prescribed off-label (use of unlicensed medicine to meet patient’s needs) and proved effective through clinical experience. IMPORTANT: Rigvir® can treat solid tumors only and therefore cannot be applied on liquid malignancies such as myeloma, lymphoma, and leukemia. Also, it has limited clinical experience related to glioblastoma, bone cancer, gallbladder cancer, thyroid cancer, and a few other types. Another restriction is that Rigvir® can only be used to treat individuals aged 18+. Step 2. 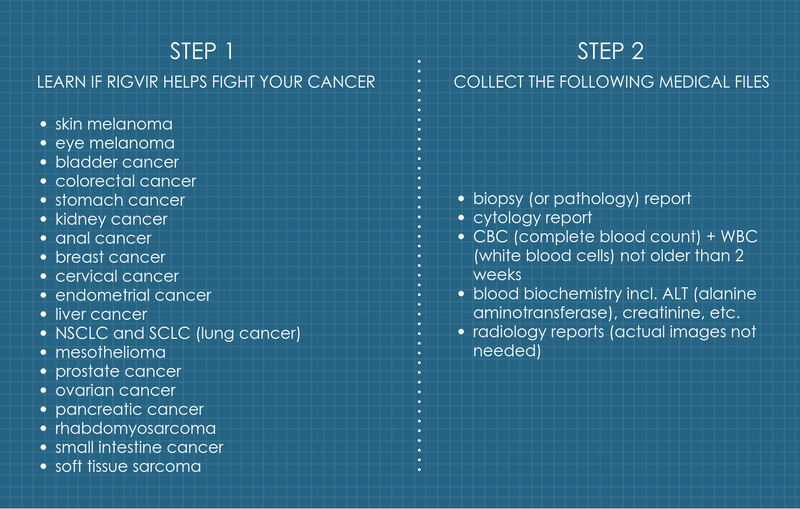 If you find your diagnosis in the left column, start collecting your medical documentation specified in the right column. This is absolutely necessary for the oncologist, virotherapist, and immunologist in Latvia to evaluate your case free of charge and inform you whether you are eligible for the Rigvir® cancer therapy. We are well aware that collecting medical documentation may take time. Unfortunately, most patients contacting us from the UK have to wait a few weeks before they receive all the reports. But we’ve got two good things to share. First, you won’t have to translate the files as the oncologists in Latvia speak English fluently. Second, once you submit online the listed above medical reports to the Rigvir clinic in Latvia, it takes up to 3 business days for the medical team to email you their decision about your eligibility for Rigvir® cancer therapy. If based on your medical files your tumor turns out to be sensitive to Rigvir® backed by sufficient clinical experience, you will get approved for Rigvir® cancer therapy. (If the answer is no, you will be immediately informed about it as well). At this point, you may either choose to travel to Latvia or stay in the UK. And no matter how appealing the second option may seem, let’s see why leaving your home for a few days is more advisable. And then we’ll discuss the home-based therapy. 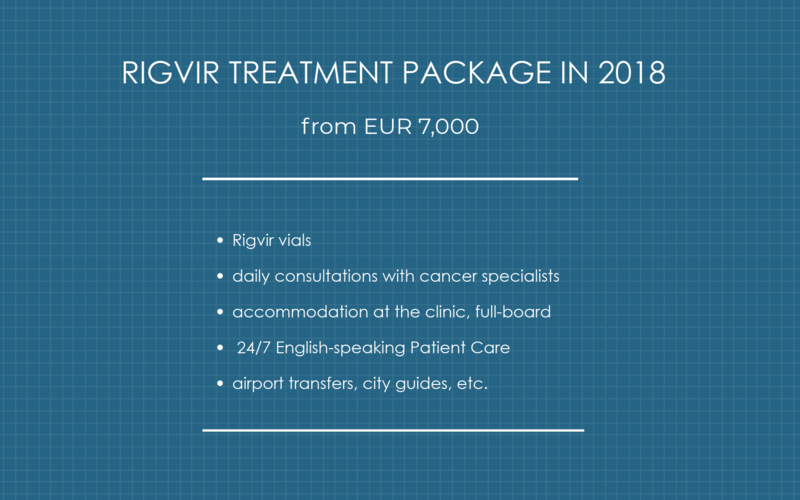 The team of an oncologist, immunologist, and virotherapist recommends you to start your week-long inpatient Rigvir® cancer therapy in Latvia as opposed to the UK for a number of reasons. From the start, it is easier to track how well your tumor responds to Rigvir® vials face-to-face and adjust your treatment in a timely manner. The Chief Oncologist of the Health Ministry of Latvia with over 30 years of experience often participates in the decision-making. Virotherapists in Latvia have been working with patients since 1960s. This means your inpatient Rigvir® cancer treatment will be based on the practical half-century expertise which is hard to find in other countries. During your 7-day inpatient treatment, you’ll do daily consultations with your oncologist and immunologist. You will also receive advice from a nutritionist, physiotherapist, and psychologist as well as a 3-month home-based oncolytic virotherapy for cancer program. Flight time from the UK to Latvia is 2,5-3 hours, making a 7-day therapy a viable choice. For instance, WizzAir offers return tickets from London to Riga for £86. You can also find similar flights with Ryanair and airBaltic for £114 and £179 accordingly. But what if you’d rather stay home? Remote Rigvir® cancer therapy can be prescribed on a very rare occasion. Specifically, when surviving the flight may affect the patient’s condition or there are other well-reasoned explanations. This is especially true for those living in such distant from Latvia places like Australia or both Americas. Here’s a video testimonial from a survivor diagnosed with metastasized malignant melanoma since 1999. She shares her recent experience with Rigvir® treatment in Latvia talking about her previous treatments, drug safety, and what it’s like to be a patient in the UK. Besides fatigue and sleepiness, the only side effect of Rigvir® discovered since 1948 has been a slight increase of body temperature to 37.5°C that lasted three days. Rigvir® is non-pathogenic. This means it targets only malignant cells leaving healthy ones untouched. Rigvir® can be safely combined with chemotherapy and radiotherapy. If would like to know whether you or someone you know can benefit from Rigvir® therapy, click the button below. We'll get back to you within the next 24 hours.